Manchester United have surprisingly identified former Liverpool star Luis Suarez as a potential transfer target. Luis Suarez left Liverpool to join FC Barcelona in the summer of 2014, for a whopping fee of £75 million. He made his competitive debut for the club in October 2014, after having served his suspension for biting Giorgio Chiellini at the 2014 FIFA World Cup. The Uruguayan got up and running right away in Spain, and quickly ended up forming a deadly attacking trio alongside Leo Messi and Neymar, called ‘the MSN’. 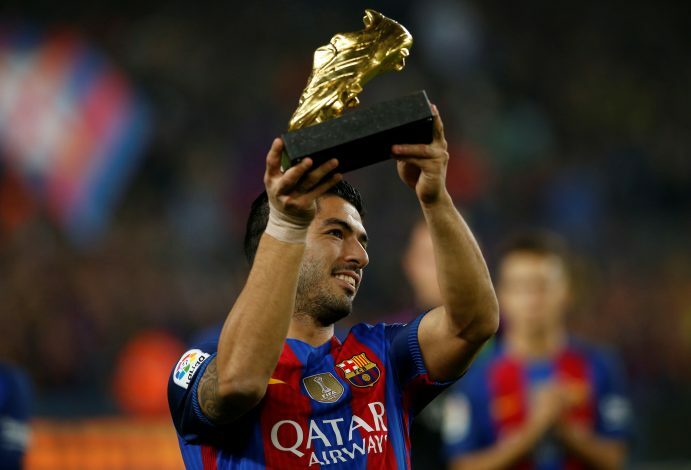 Suarez bagged 25 goals and 20 assists in all competitions for the Catalan club in his first season, and the MSN ended that campaign with a total of 122 goals – the most in a season for an attacking trio in Spanish football history. The 29-year-old has continued his lethal goalscoring form this season as well, and already has 10 goals to his name. However, Barcelona haven’t yet tied Luis Suarez down to a new long-term contract – unlike his fellow strike partners Messi and Neymar – and this has given rise to enormous transfer speculation, linking Luis with a move away from the La Liga club. According to reports in Spain, many top clubs from all around Europe are monitoring Suarez’s situation, including one very unlikely outfit: Manchester United. Luis Suarez has quite a history with Manchester United from his Liverpool days, be it controversial goals, simulated dives, or that infamous racism incident involving the former Red Devils’ captain, Patrice Evra. Therefore, reports of the Old Trafford club being interested in the Uruguay international’s services come as a huge shock, for both Liverpool and Manchester United fans. As per these rumours in Spain, Jose Mourinho is looking to sign a proper goal scorer, so as to replace his current out-of-form strikers Zlatan Ibrahimovic and Wayne Rooney. And since Suarez fits the Portuguese’s requirements perfectly, the United officials have begun examining his situation at Barca, and Jose is willing to make a move for him as soon as this coming January.